This is a quick post in between a testing session. 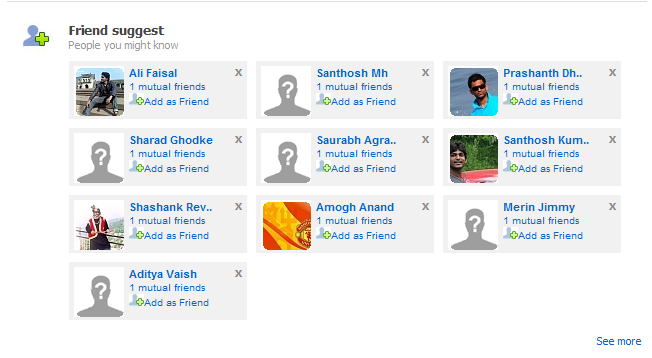 Right now I am testing www.ibibo.com and they have a 'Friend Suggest' feature where ibibo suggests friends for you. 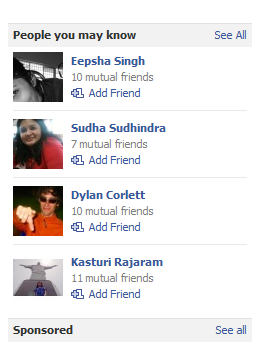 I assume that friends are suggested based on some algorithm. 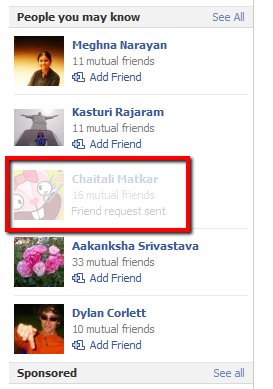 The number of mutual friends is also highlighted. 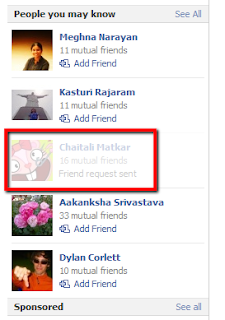 I clicked on 'Add as a friend' against one of the profiles displayed. A popup was displayed. While it is good to inform the user about an action he performed, as a user I was not able to perform any other action till I dismissed the popup by clicking on the OK or close button. Compare that to what Facebook does. Even Facebook has the Friend Suggest feature by another name: 'People you may know'. 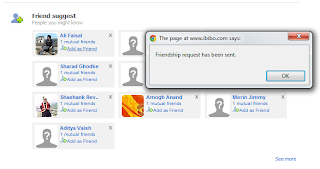 Once I clicked on 'Add Friend' link, the particular profile slowly disappeared after displaying 'Friend request sent'. Do you see the difference? Is there a problem here? * What is the purpose of the feature? * How will the users use it? * Are there any problems in what you observe? Primarily any inconsistency or usability issues? * Have you seen such a feature elsewhere? Comparable products heuristic? Let us go through each of the questions in detail. As a tester, do you understand the purpose of the feature. What problem does the feature try to solve? As the product is a social networking site, more the friends, the better. The feature is trying to help you add friends. 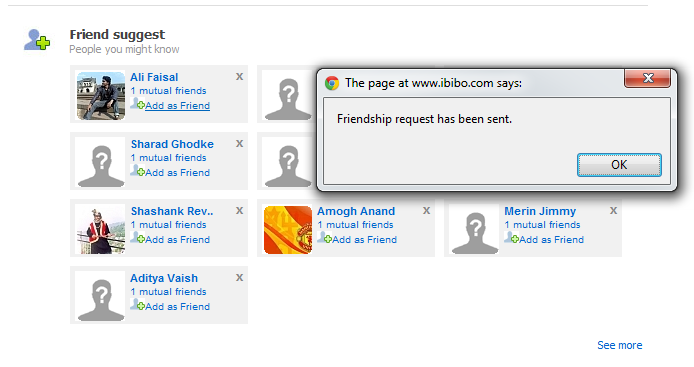 In the case of ibibo, does it really help? As a user, is it easy to understand the feature? Is there help available? Is it user-friendly? Can the user use all the feature's functionality? How is the first impression? Is the feature easily visible or hidden behind a lot of junk? This morning, I read the latest blog post by Michael Bolton - http://www.developsense.com/blog/2011/12/why-checking-is-not-enough/ on why checking is not enough. I am not sure how a check might find the level of user's frustration or happiness. When I was not able to click on any other link till I dismissed the confirmation popup, I was slightly frustrated. Confusion, frustration, delight and other emotions - how will a check handle it? As a tester, are you aware of your emotions when you test, after the tests? Finally, as a tester make use of the similar products heuristic if given a chance. Just as I write this post, I hear the dialogue from 'First Blood II' - Mind is the best weapon. So true. Maybe, next time too - I will use the four questions as a quick heuristic. What is the purpose, who will use it, any usability issues, how the competitor handles it? nice..!!!! a very important point to notice being a tester..
"How is the user been educated to use this feature before"
Because users tend to like familiarness when performing operations, so they don't have to learn any new functionality. Thanks Bhawin and Jokin for the comments. When I read your comment, I got a new line of thought. "How is the user been educated to use this feature before" - How do we train the user? Do we have instructions, a demo/video? While I was reading through this blog post, one question stands out. Your questions about what competitors are doing makes sense in the product line, but lets talk about service line industry which also requires the services of a tester. Now given the scenario that you are infact testing for a specific service of which you have no idea about other services in the fray that are doing something similar, what would the fourth question be ?